Castleford Tigers are set to make a decision on whether they will be signing forward Chris Clarkson once his trial period is over. The former Hull KR and Leeds Rhinos back-rower or loose forward was taken on trial by the Tigers after finding himself without a club when he was not offered a new contract by Hull KR at the end of the 2018. 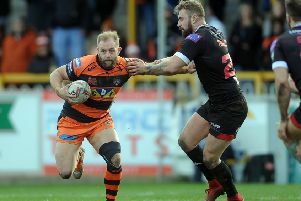 He has been training with the Tigers for the past five weeks, but game time has been limited and he has only been able to play a short stint off the bench in the pre-season game against Leeds Rhinos. Head coach Daryl Powell explained: “It’s been hard for Chris because we only had the Leeds game and then I wanted to give the main chunk of game time to the players who will be playing in the Catalans game. “But Chris has been good. He’s a good kid, he’s a good rugby league player and we’ll have a good look at him. Powell, meanwhile, has praised the way Luke Gale is handling his adversity on being out for the season after rupturing an Achilles tendon. He added: “Luke Gale is still finding things tough, it’s a long road for him. But he’s handling it really well. “After the initial shock he moved on pretty quickly to getting it fixed up, which has happened now. He’s on the long road to get back, to be able to train first and foremost and then get back on the field.